Som tam is one spicy mother of a salad. Memorably, I once visited the Thai Food Festival in Greenwich Park after a heavy girls' night on the ciders (and Campari - bleurgh). I needed fresh clean reviving flavours. Staggering around in the blinding sun, I made my way over to a stall selling som tam; a lady with an enormous mortar and pestle was pounding away, creating this salad. She'd hold up various ingredients - 1 birds eye chilli? Two? Salted crab? - and with a nod or a shake she'd throw them in, and within minutes I had myself a tray of the stuff. Settling down, I took my first bite. My face was engulfed with fiery chilli flames, and I legged it over to the nearest stall, hopping on each foot until I got my hands on a watermelon juice to soothe the pain. Despite all this, it was addictive; salty, spicy, sour and sweet with a hint of fish. 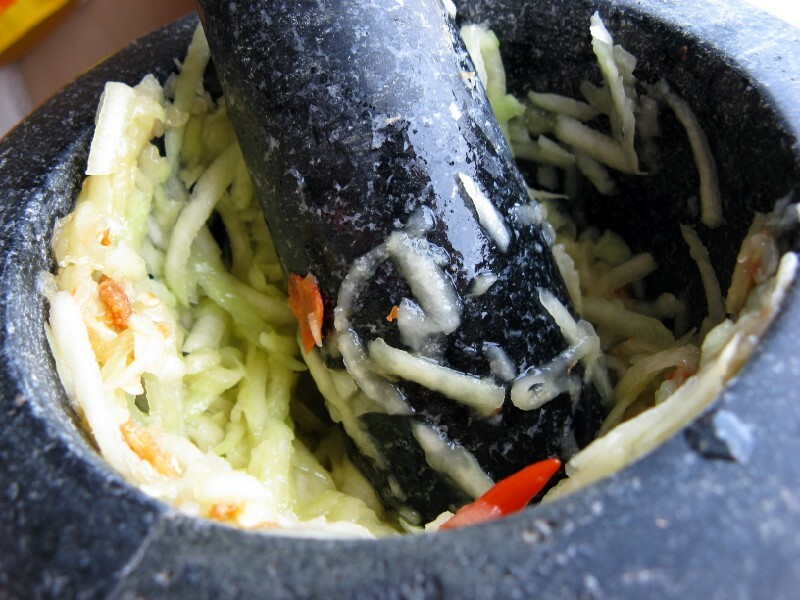 Som tam is Thai, and it is translated literally to 'sour pounded'. Typical ingredients include shredded unripe green papaya, chilli, palm sugar, salted crabs or dried shrimp and fish sauce. I used a green mango for this instead, as I like the fragance it gives and it's easier to find than papaya. You should keep tasting and tasting as you add ingredients to get that perfect balance of sweet, salty and heat. Peel your mango and grate it on the large grater, place it in a bowl. In a mortar & pestle, throw in the clove of garlic and pound to a paste. Add the dried shrimp and give them a pounding. Add the sugar, juice of the lime and the birds eye chillis (whole) and give it a quick bash. Add half the shredded mango and 1 tbsp of the fish sauce. Give it a good bashing, then mix it together with the rest of the shredded mango. At this point, taste it to see if it needs any more fish sauce or sugar. It should be face-crunchingly spicy. Smash the cherry tomatoes (shield yourself for squirtage) in the mortar, and then add to the mango. Leave to sit for half an hour, and then serve with some sticky rice. Butlers Thai in Ealing (a great great place) throw in sone peanuts for garnish, but you're right, it's a fiery mother of a salad! Campari - terrible drink. 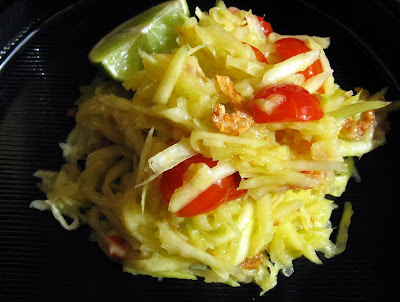 Som Tam - great salad, interesting use of mango rather than papaya. i love Som Tam. i actually find that 2/3 green pappaya and 1/3 green mango is my favourite combination. other great additions - crushed peanuts or pine nuts, dried cranberries, pomegranate seeds. Oooh, is this the green mango that's wonderfully crunchy and not too sweet nor too sour? I've been looking for it! Where did you buy it please? I had that in Thailand and it was fabulous just sliced up with chilli powder, salt and sugar. It has many different incarnations in Thailand and was always the dish that was used as a rite of passage by all vendors meeting expats. A knowing smile and 'pet mai'? (Spicy?) was followed by a warning. As I'm a spicy food lover they'd normally tut in disbelief at a foreigner having it 'Thai style'. 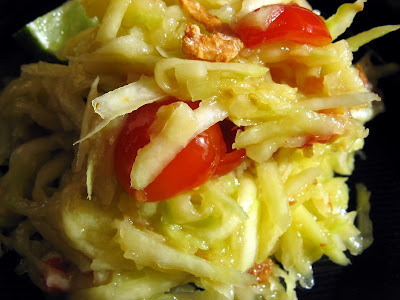 Love green mango salad too - also a great and oft eaten dish. Nice post.